Traveling with your parrot can be fun and enjoyable if done properly. 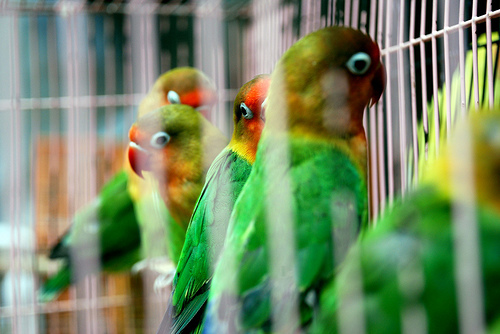 You must get a travel cage for your parrot, likely smaller than the cage you have for it at home. Try to get one as large as possible though. It should be able to stretch, and probably climb, perch and flap its wings. It also should have enough room for you to put in your parrot’s food dish, water dish and toys. When shopping for a cage, find the one that is as familiar as possible. It could have a layout that resembles its home cage. Also pack a familiar toy in the cage so your parrot feels comfortable. For your best interest, this should probably be a silent one, and bells and plastic toys can bang on the sides, so you might want to avoid those. Plastic or metal toys also could hit your parrot if the ride is rocky. Rope is probably the best toy for a travel cage. 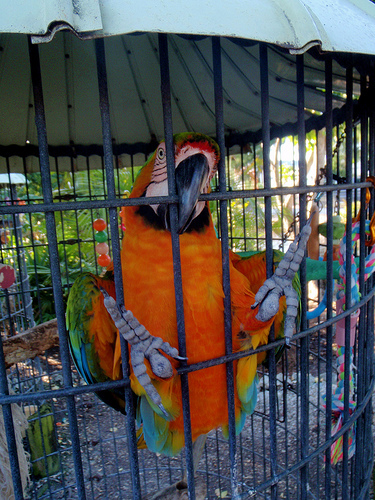 Try to make your parrot familiar with its cage before you embark on your trip. You could place it in the cage for a few minutes a day before you leave, and have the travel cage in a different room so it becomes acquainted with different surroundings. If you are going on a long journey, it might help to take your parrot on several short journeys in this fashion so that it becomes used to the motions. 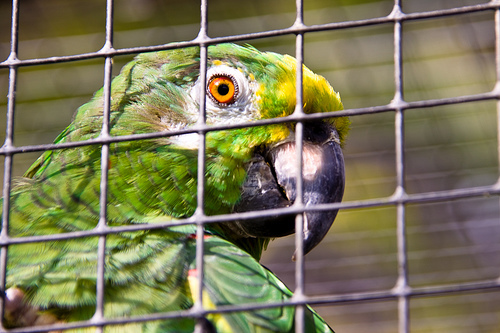 If you are taking your trip in a car, a good way to secure the parrot cage is to put it in the back seat, facing the front, with a seat belt or safety straps. Front seats are not as safe for parrots, in case the airbag bursts. Your parrot’s perch should be close to the front of the cage, and the food and water should be at its sides. When it is situated towards the front, it won’t go flying anywhere if there is sudden braking. You should avoid using soft perches; perches made of wood with sand on them are the best, as they are better to grip. Before you leave on your trip, have your parrot thoroughly and properly groomed. If necessary, have its beak trimmed, so that it can eat and climb comfortably. Its nails should also be trimmed, so it won’t have trouble perching. Bring along your parrot’s favorite seeds and treats. Different locations may not sell the brand that it likes, and traveling is not the time to start experimenting with new foods. It is a good idea to give your parrot fresh fruits and vegetables. Has anyone tried to board a jet blue flight with a parrot although they do not allow them.